(…continued) Europe today has total religious freedom, but very little religious conviction anymore. Muslim nations have strong religious convictions, but very little sense of religious freedom. The First Amendment has helped the United States maintain this delicate balance, but there are dangers now as there always has been. Secondly, there are those, even in the church, who want to say that religion should be kept private, and need not influence one’s life outside the walls of the church, such as in political discussion or decision-making. Both are dangers which must be avoided. 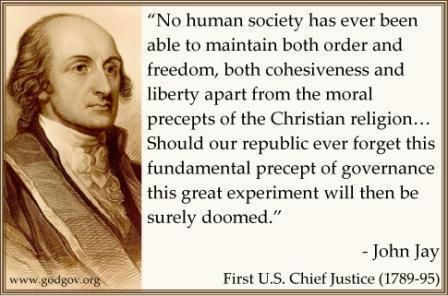 There is much more to be said about all this, but let’s hear a word from George Washington. He talked about his very thing in his Farewell Address in 1796 at the end of his presidency. He said: “Religion and morality are indispensable supports of political prosperity, and no true patriot would oppose them. Where would the security for property, reputation, or life be without the sense of religious obligation? Morality cannot be sustained in a nation without religion.” Similar quotes by other Founding Fathers could fill a huge book. Those men had a wide variety of religious beliefs, but all believed in the importance of the moral base that religious faith gives to a nation. The Chinese are trying to learn from the success that we take for granted, and they are learning the clear lessons from our history that we have neglected. From what I have read, a student can major in History in most of the colleges in this country, and in four years, not hear one word of any of this. That’s how it is in today’s anti-religious culture. But this is our heritage and what has formed the fabric of our society. If we lose this moral foundation, everything else with unravel, and we will not remain strong or safe. To say that the Founder Fathers tried to build a government that encouraged virtue in its citizens is certainly not to say our government or citizens have always been virtuous. No government action can guarantee virtue, but the goal is to enhance and encourage it. The Founding Fathers were well aware of the sin in every person, and also worked to establish a government that provided checks and balances to restrict the sinful ambitions of those who ruled– but that is another story. One can argue about how well that has worked. But what cannot be argued or denied is that people from all over the world dream of coming here; and very few dream of leaving here, even among those most critical of what this nation stands for. It is for freedom that Christ has set us free. Stand firm then… You were called to be free, but do not use your freedom to indulge the sinful nature; rather, serve one another in love. The entire Law is summed up in a single command: ‘Love your neighbor as yourself.’ So I say, live by the Spirit… and the fruit of the spirit is love, joy, peace, patience, kindness, goodness, faithfulness, gentleness, and self-control. God of our fathers, whose Almighty hand has made and preserved our nation, grant that our people may understand what it is they celebrate today. May they remember how bitterly our freedom was won, the down payment that was made for it, the installments that have been made since this Republic was born, and the price that must yet be paid for our liberty. May freedom be seen, not as the right to do as we want, but as the opportunity to want to do what is right. May it ever be understood that our liberty is under God, and may our faith be something that is not merely stamped upon our coins, but expressed in our lives. To the extent that America honors Thee, wilt Thou bless America, and keep her true as Thou hast kept her free, and make her good as Thou hast made her rich. Amen.